Lane departure crashes are the single largest category of fatal and major injury crashes in Iowa. The Iowa Department of Transportation (DOT) estimates that 60 percent of roadway-related fatal crashes are lane departures and that 39 percent of Iowa’s fatal crashes are single-vehicle run-off-road (SVROR) crashes. 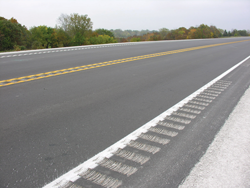 Addressing roadway departure was identified as one of the top eight program strategies for the Iowa DOT in their Comprehensive Highway Safety Plan (CHSP). The goal is to reduce lane departure crashes and their consequences through lane departure-related design standards and policies including paved shoulders, centerline and shoulder rumble strips, pavement markings, signs, and median barriers. Lane-Departure Safety Countermeasures: Strategic Action Plan for the Iowa Department of Transportation outlines roadway countermeasures that can be used to address lane departure crashes. This guidance report was prepared by the Institute for Transportation (InTrans) at Iowa State University for the Iowa DOT. The content reflects input from and multiple reviews by both a technical advisory committee and other knowledgeable individuals with the Iowa DOT.